Earlier this week, the Federal Trade Commission announced a settlement for owners of about 80,000 Volkswagen, Audi and Porsche 3.0-liter V6 diesel vehicles that cheated on emissions tests. Here’s everything you need to know about that settlement. The earlier settlement for the 2.0-liter four-cylinder engines affected close to 480,000 cars spanning between the model years 2009 and 2015, and cost Volkswagen a whopping $14.7 billion: $10.03 billion of which covered buybacks, restitution and vehicle modifications; $2.7 billion of which had to be invested into an environmental remediation trust to help offset NOx pollution; and $2 billion of which VW had to invest in projects that promote zero-emissions tech. The 2.0-liter engine was found in cars like the Volkswagen Golf, Jetta and Audi A3. The 3.0-liter V6, the one covered in this settlement, is found in bigger cars like the Volkswagen Touareg, Audi Q5 and Porsche Cayenne. Now, earlier this week, the FTC announced the 3.0-liter settlement, which detailed how owners of these V6 Audis, VWs and Porsches would be compensated. And it’s similar to the 2.0-liter settlement, but with one major difference. That difference would be the fact that all owners of 2.0-liter cars were eligible for the buyback, because VW could not find a feasible engineering solution that would get the affected cars back into emissions compliance without markedly affecting performance. That’s what made the settlement so expensive. (It’s worth noting that VW is still working on a modification that would improve emissions to levels set by the EPA and California Air Resources Board, CARB). In the case of 3.0-liter cars, though, VW thinks some of the cars—referred to as “generation two” cars—can be completely mended without too much fuss, meaning owners can finally have the cars they thought they had purchased in the first place. If VW is indeed able to pull that off, the owners of those vehicles will still receive a cash payment, but they won’t have the option of a buyback. Not having to buy back generation two vehicles would result in a lesser cost to VW of about $1.2 billion in compensation to owners (plus, presumably, whatever it costs to actually fix the cars). If the company isn’t able to devise the fix for generation two vehicles, it will have to offer a buyback to every customer (both generations one and two), and that cost number rises to $4.04 billion if all owners opt in. Generation 1 vehicles are 2009 to 2012 Volkswagen Touaregs and Audi Q7s, with the first two years of each model considered sub-generation 1.1, and the last two sub-generation 1.2. As such, VW will offer a buyback or modification to all owners of generation one cars, as well as a restitution payment. Like the 2.0-liter cars, that buyback amount is meant to represent the value of the vehicle prior to the depreciation caused by the Sept. 18, 2015 Dieselgate scandal announcement. The court calculates this buyback value as simply the National Association of Auto Dealer’s Clean Trade-in value published in the Sept. 2015 NADA Used Car Guide, adjusted for factory options, mileage and geographical region. That mileage adjustment assumes owners drive 15,000 miles a year. So if someone turns their vehicle in on Sept. 18, 2018 (three years after Dieselgate broke) with 100,000 miles, the Clean Trade-In value for a 55,000 mile vehicle would be used to devise the buyback amount. Buyback amounts for generation one vehicles range from $24,755 to $57,157. The quote above boils down to, essentially, the difference between what someone could pay for a car on the dealer’s lot and what someone could trade the car in for. Take that number, add state and local taxes, then add $5,155 and you end up with your restitution amount. Restitution amounts for generation one cars range from about $7,755 to $13,880. 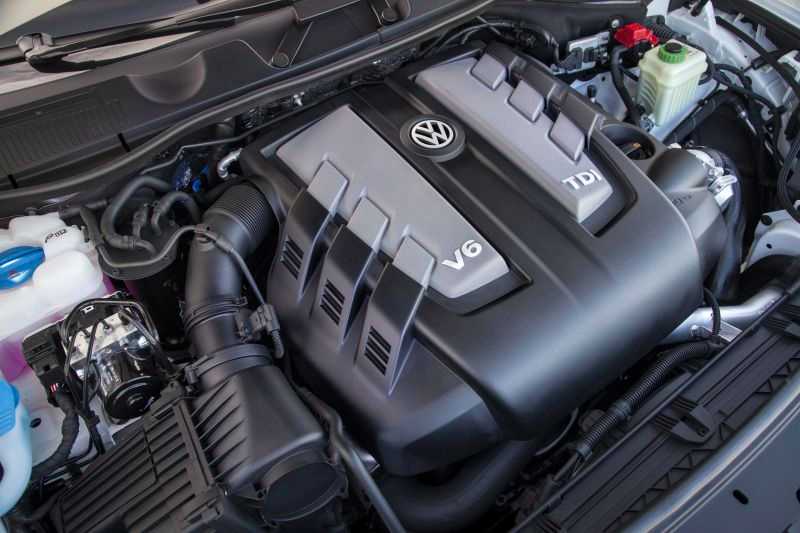 Like in the 2.0-liter settlement, the 3.0 V6 agreement does allow VW to devise an emissions modification that would bring the affected generation one vehicles’ NOx output down significantly, but still not within the limits to which they were originally certified. The new emissions requirement for generation 1.1, decided upon by the EPA and California Air Resources Board, is Tier 2, Bin 7 (except particulate matter must be .01 g/mile), and generation 1.2s must comply with Tier 2, Bin 6. These standards define how much of each type of pollutant can be expelled during various drive cycles. Further details on allowable pollution levels are specified here. If VW can devise a modification meeting those new, reduced emissions requirements without affecting vehicle performance too drastically, owners will not have to participate in the buyback, but can instead have their cars improved, while still receiving a restitution payment. Generation two cars include 2013 to 2016 Touaregs; 2013 to 2015 Audi Q7s; 2014 to 2016 Audi A6s, A7s, A8s, A8Ls an Q5s; and 2013 to 2016 Porsche Cayennes, and VW anticipates it will be able to bring these cars back into compliance. If you had your car brought in for such a fix, called an Emissions Compliant Repair, you would also get a cash compensation called an an Emissions Compliant Repair Payment (or an Owner Repair Payment). That cash amount is calculated by taking 10 percent of the vehicle’s Sept. 2015 NADA Retail Value, adjusting it for options, and adding $3,596.74. The 2.2 SUV sub-generation consists of 2015 and 2016 VW Touaregs and Porsche Cayenne Diesels. All diesel 2013 and 2014 Touaregs, Audi Q7s and Porsche Cayennes, as well as 2015 Audi Q7s, A6s, A7s, A8s, A8Ls and Q5s make up 2.1 SUV. And 2 PC is made up of 2014, 2015 and 2016 Audi A6s, A7s, A8s, A8Ls, and Q5s. If VW does not come up with a fix on time, such that the EPA and California Air Resources Board can approve it by the dates shown in the table above, the company can extend the decision date for any sub-generation by a maximum of 90 days, but they’ll have to pay a non-refundable $500 per eligible vehicle in that sub-generation for every 30 days they have to extend. (1) a reduction in calculated fuel economy using the EPA formula of more than 3 MPG; (2) a decrease of greater than 5% in peak horsepower; or (3) a decrease of greater than 5% in peak torque. So basically, VW need to get these cars compliant, and they need to do it on time, without affecting the car’s fuel economy, horsepower or torque. If they can do that, they stand to save billions. If they still can’t come up with an emissions compliant repair on time (or at all), VW will have to offer buybacks (based on the NADA Clean Trade In Value) and a Reduced Emissions Modification (whose emissions requirements are specified here), both of which come with a restitution payment just like those offered to generation one vehicle owners. That restitution payment is higher than the Emissions Compliant Repair Payment they’d pay owners if they actually found a fix, and it is calculated as: $8,728.00 for Volkswagens, $9,728.00 for Audis, and $11,228.00 for Porsches plus a variable component calculated much like the one mentioned in the generation one buyback section of this article. If VW can’t come up with an emissions compliant repair or a reduced emissions modification that CAFE and the EPA agree upon, then only the buyback column (which includes restitution) in the table above will apply to generation two TDI owners. Just like in the 2.0-liter settlement, if you sold your car after Sept. 18, 2015, you are eligible for part of that restitution payment (in the case of a buyback) or emissions compliant repair payment (in the case of a generation two emissions compliant repair), so whoever owns the car will have to split those payouts with you. The idea here is that the Sept. 18, 2015 Dieselgate announcement could have affected your car’s value, and you could have lost money in your sale. Thus, you are entitled to what’s called an Eligible Former Owner Restitution, or a Former Owner Repair payment—those are approximately half of the total owner restitution amount or repair payments. But with the 3.0-liter V6s, some might qualify as a second eligible former owner—for example, if the person who bought the car from you after Sept. 18, 2015 sold it after Nov. 2. Though not explicitly stated, this is most likely to compensate that second owner from the reduced vehicle value resulting from the Notice of Violation for the 3.0-liter diesels, which came out on Nov. 2, 2015. So basically, there were two events, Dieselgate’s initial introduction in Sept. 2015 and the Notice of Violation for 3.0-liter diesels, that could have caused depreciation. Thus, there can be two eligible former owners who would have to split the former owner restitution or repair amount (they’d each get 25 percent), while the current owner who was fixing or selling the car back would get 50 percent. These eligible former owners have until May 1 to identify themselves and claim their cash, starting the day after the court enters the preliminary approval order, which should happen on Feb. 14. It’s worth noting that anyone who sells their car after January 31 (the day the settlement was announced) is no longer eligible for a former owner restitution or repair payment. Earlier this week, a settlement was also filed to resolve claims against Bosch, a major automotive supplier that had been implicated in devising the defeat device that allowed these VWs to cheat on their emissions tests. In the settlement, Bosch admits no fault but agrees to pay $327.5 million, which means owners of 3.0-liter vehicles will each receive $1,500 in addition to the money from Volkswagen’s settlement. To see the total of how much each affected 3.0-liter TDI is worth—including payouts from both VW and Bosch—have a look at these tables. On top of that, anyone who gets their cars modified or repaired will have a nice warranty that includes an Engine Long Block Warranty (which covers the engine sub-assembly: block, crankshaft, head, camshaft, valvetrain) as well as an emissions control system warranty. That latter warranty includes the entire exhaust aftertreatment system, the entire fuel system (including fuel pumps), the EGR system, and the turbocharger system. Both of those warranties last either 10 years and 120,000 miles after the car’s initial purchase date, or four years and 48,000 miles from the date of the emissions modification. VW cannot sell their cars anywhere in the world unless the vehicles have had their emissions at least reduced to values specified by the U.S. Environmental Protection Agency and California Air Resources Board (or if they’re brought into compliance, as anticipated for gen two cars). The table above shows the dates by which the company has to submit modifications for review, after which CARB and the EPA will have 45 days to approve or deny. VW has to until Nov. 30, 2019 to either buy back or modify 85 percent of generation one cars, and until May 31, 2020 to buy back, repair or modify 85 percent of generation two cars. VW will face severe financial penalties if they can’t meet that percentage (those penalties will go into environmental mitigation projects). This whole buyback process begins after the final approval hearing, which the court says will likely happen between May 1 and May 5, 2017. After that, if you own a 2009 to 2012 Touareg or Q7, you can sell your car back for big money, and then receive a hefty cash restitution payment. And if you’re a generation two 3.0-liter diesel owner, you may be able to get your car fixed entirely, but still get some cash. On top of that, you’ll get $1,500 from Bosch and an excellent warranty. Plus, pollution from these cars will be made up for via an environmental mitigation trust. If you’re affected by this settlement, please keep us apprised of how it’s going for you. We can be reached at tips@jalopnik.com. Additional information has been added to this post to clarify former owner eligibility and buyback timing.